Agriculture (15.3% of GDP, 2010): Products--timber, rubber, rice, palm oil, coffee. Land--17% cultivated. Trade: Exports (2010)--$158 billion including oil, natural gas, crude palm oil, coal, appliances, textiles, and rubber. Major export partners--Japan, U.S., China, Singapore, Malaysia, and Republic of Korea. Imports (2010)--$136 billion including oil and fuel, food, chemicals, capital goods, consumer goods, iron and steel. Major import partners--Singapore, China, Japan, U.S., Malaysia, Thailand, South Korea. During World War II, Japan invaded Indonesia (in early 1942), outclassing a combined American, British, Dutch, and Australian military command. Sizeable U.S. naval forces and smaller air and ground forces sent to defend Indonesia were defeated, with heavy losses in ships and large numbers of Americans killed or captured. The Japanese treated captured Allied troops and interned Western civilians with extreme cruelty. Because of local animosity toward Dutch colonial rule, there was no anti-Japanese guerilla movement as in the Philippines and Malaysia, and most Indonesians initially welcomed the Japanese as liberators. But increasingly harsh Japanese rule strengthened the prewar independence movement, and on August 17, 1945, 3 days after Japan’s surrender to the Allies, a small group of Indonesians, led by Soekarno and Mohammad Hatta, proclaimed independence and established the Republic of Indonesia. They set up a provisional government and adopted a constitution to govern the republic until elections could be held and a new constitution written. Fighting soon broke out between Indonesian independence groups and Allied forces--mainly British, Indian, and Australian forces--sent to accept the Japanese surrender. Dutch efforts later to reestablish complete control met resistance. Following the Philippines' independence in 1946, the U.S. was unwilling to see the Netherlands use post-war Marshall Plan support to indirectly fund the suppression of Indonesia’s independence. Negotiations and on-and-off fighting in Indonesia continued until 1949. The stalemate, combined with reduced international support and a devastated economy in the Netherlands, led to the Dutch decision to withdraw from Indonesia. Colonial rule and its violent end left a legacy in Indonesia of mistrusting foreign motives, especially those of large powers. In 1950, Indonesia became the 60th member of the United Nations. Shortly after hostilities with the Dutch ended in 1949, Indonesia adopted a new constitution, providing for a parliamentary system of government in which the executive was chosen by and accountable to parliament. Parliament was divided among many political parties before and after the country's first nationwide election in 1955, and stable governmental coalitions were difficult to achieve. The role of Islam in Indonesia was debated. Soekarno defended a secular state based on Pancasila, five principles of the state philosophy--monotheism, humanitarianism, national unity, representative democracy by consensus, and social justice--codified in the 1945 constitution, while some Muslim groups preferred either an Islamic state or a constitution that included a preambular provision requiring adherents of Islam to be subject to Islamic law. At the time of independence, the Dutch retained control over the western half of New Guinea (known as Irian Jaya in the Soekarno and Suharto eras and as Papua since 2000) and permitted steps toward self-government and independence. The 2004 legislative elections took place on April 5 and were considered to be generally free and fair. Twenty-four parties took part in the elections. Big parties lost ground, while small parties gained larger shares of the vote. However, the two Suharto-era nationalist parties, PDI-P and Golkar, remained in the lead. PDI-P (opposition party during the Suharto era) lost its plurality in the House of Representatives, dropping from 33% to 18.5% of the total vote (and from 33% to 20% of the seats). The Golkar Party (Suharto’s political party) declined slightly from 1999 levels, going from 22% to 21% of the national vote (from 26% to 23% of DPR seats). The third- and fourth-largest parties (by vote share) were two Islamic-oriented parties, the United Development Party (PPP) (8% of the votes, 10.5% of the seats) and National Awakening Party (PKB) (10.5% of the vote, 9.45% of the seats). Susilo Bambang Yudhoyono’s nationalist Democratic Party (PD) won 7.45% of the national vote and 10% of the DPR seats, making it the fourth-largest party in the DPR. Seven of the 24 parties won no DPR seats; six won 1-2 seats, and the other six won between 2%-6% of the national vote (between 5-52 DPR seats). In 2009, national legislative elections were held on April 9 and presidential elections were held in July. They were peaceful and considered free and fair. New electoral rules required that a party win 2.5% of the national vote in order to enter parliament. A total of thirty-eight national and six local (Aceh only) parties contested the 2009 legislative elections. At least 171 million voters registered to vote in these elections. Voter turnout was estimated to be 71% of the electorate. Nine parties won parliamentary seats in the House of Representatives (DPR). The top three winners were secular nationalist parties: President Yudhoyono’s Partai Demokrat, with 20.85% of the vote; Vice President Jusuf Kalla’s Golkar Party, 14.45%; and former president Megawati’s opposition PDI-P party, with 14.03%. The next four largest parties were all Islamic-oriented parties: PKS, PAN (6%), PPP (5.3%), and PKB (4.9%). Only PKS maintained its 2004 vote share (7.88%); the other three declined in popularity. The smallest two parties in Parliament, Gerindra and Hanura, with 4.46 and 3.77% of the vote respectively, were headed by retired Suharto-era army generals Prabowo Subianto and Wiranto (one name only). The 2009 DPR members took their seats October 1. Also in 2009, the threshold was revised so that only parties or coalitions of parties that gained at least 20% of the House of Representatives (DPR) seats or 25% of the vote in the 2009 national legislative elections would be eligible to nominate a presidential and vice presidential ticket. Partai Demokrat, Golkar, and PDI-P parties, the top winners in the legislative elections, nominated presidential candidates. To win in one round, a presidential candidate was required to receive more than 50% of the vote and more than 20% of the vote in 17 of Indonesia’s 33 provinces. If no candidate did so, the top two candidates would have competed in a second round in September 2009. Three tickets competed in the presidential elections. Incumbent President Yudhoyono and his running mate, non-partisan former Central Bank Chair and Economics Minister Boediono, won the election with such a significant plurality--60.6%--that it obviated the need for a second round of elections. Main challenger and former president and opposition leader Megawati Sukarnoputri and running mate Prabowo Subianto trailed with 28%. Meanwhile, Vice President Jusuf Kalla and running mate Wiranto came in last at 12.7%. Indonesia’s Consultative Assembly (MPR) inaugurated President Susilo Bambang Yudhoyono for his second term as president on October 20, 2009. Indonesia adopted a bicameral legislative system following the establishment of the DPD (Regional Representatives Council), which was first elected in 2004. The DPD is composed of four representatives from each of Indonesia’s 33 provinces. Although it can make proposals and submit opinions on legislative matters concerning the regions, it does not have the power to create legislation. The MPR consists of both the DPD and the DPR. The MPR has the power to inaugurate and to impeach the president (upon the recommendation of the DPR). The current Speaker of the MPR is Taufik Kiemas (from the opposition PDI-P Party) and the Speaker of the DPR is Marzuki Alie (from the ruling Democrat Party). These speakers and four deputy speakers for the DPR and MPR took up their positions on October 5, 2009. The largest party in the DPR, now President Yudhoyono’s Partai Demokrat, filled the influential DPR speaker position. President Yudhoyono's Partai Demokrat (PD) holds 148 of the 560 seats in the House of Representatives (DPR), making it the largest political party represented in the legislature. Partai Demokrat has a coalition with Golkar and four Islam-oriented parties. The coalition holds a majority of the seats in the DPR. The People's Consultative Assembly (MPR) has 692 members, including 560 members of the DPR and the 132 representatives of the Council of Regional Representatives (DPD). Up to and through 2004, citizens elected legislators for the DPR and DPD, but their vote was based on a party list system. This ensured that the party elite, placed at the top of the party candidate lists, were voted into office. In 2009, a multi-member district “majority vote wins” system allowed voters for the first time to directly put a candidate who won a plurality of votes into office. Indonesia’s improving growth prospects and sound macroeconomic policy have many analysts suggesting that it will become the newest member of the “BRIC” grouping of leading emerging markets. 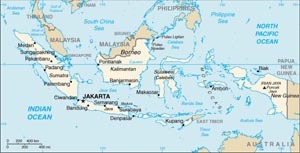 In December 2011, Fitch Ratings upgraded Indonesia’s sovereign debt rating to investment grade. A similar upgrade to investment grade is expected from Standard and Poor’s and Moody’s. Economic Policy: After he took office on October 20, 2004, President Yudhoyono moved quickly to implement a "pro-growth, pro-poor, pro-employment" economic program, which he has continued in his second term. The State Ministry of National Development Planning (BAPPENAS) released a Medium-Term Development Plan for 2010-2014 focused on development of a “prosperous, democratic and just” Indonesia. The Medium-Term Development Plan targets average economic growth of 6.3%-6.8% for the period, reaching 7% or above by 2014, unemployment of 5%-6% by the end of 2014, and a poverty rate of 8%-10% by the end of 2014. President Yudhoyono’s economic team in his second administration is led by Coordinating Minister for Economic Affairs Hatta Rajasa. Sri Mulyani Indrawati continued as Finance Minister until May 2010, when she resigned to take a senior position at the World Bank. She was succeeded by Agus Martowardojo, a well-respected banker who had led Indonesia’s largest state-owned bank. In July 2010, Indonesia’s DPR Commission XI approved the appointment of Darmin Nasution as Governor of Bank Indonesia, following a 14-month vacancy of the position after former Governor Boediono stepped down to become Yudhoyono’s running mate. In May 2010, President Yudhoyono established a National Economic Committee to provide strategic recommendations to accelerate national economic development and a National Innovation Committee to provide input and recommendations to increase national productivity, create a culture of innovation, and speed up economic growth. In May 2011, President Susilo Bambang Yudhoyono launched the Master Plan for the Acceleration and Expansion of Indonesia’s Economic Development (MP3EI), to increase infrastructure and investment spending and to provide a roadmap for Indonesia to move up the value-chain and increase the level of innovation. The plan outlines Rp 4,000 trillion ($ 468.5 billion) in potential infrastructure projects in multiple sectors including hydroelectric and solar power, palm oil, new roads including toll motorways, mining , expansion of broadband internet, and nickel, cobalt and aluminum factories. In 2010, Indonesia has seen an increase in manufacturing output and exports, with relatively cheap labor and a complementary large and growing domestic market. Exports of natural resources, such as oil and gas, coal and crude palm oil (CPO) have made up around 50% of Indonesia’s exports and have been key drivers of growth. With the share of total exports to fast-growing emerging markets increasing and demand for commodities likely sustainable, export growth is likely to remain buoyant. In contrast, imports may grow even faster with infrastructure development andstrong domestic demand growth. ,. Net exports will likely continue to diminish and, with higher net income outflows (the counterpart to large portfolio inflows), it is expected the current account will eventually shift into deficit in the medium term. BI has started to move toward Basel II standards in 2011, which focus on advancing other aspects of the Indonesian Banking Architecture (IBA) and has improved operations of its credit bureau to centralize data on borrowers. The IBA is a joint effort between BI, the Capital Market and Financial Institution Supervisory Board (BAPEPAM-LK), and the Ministry of Finance that was launched in 2004. A cornerstone program of the IBA is the structural reinforcement of the national banking system, aimed at building stronger capitalization for commercial banks to underpin its expansion and accelerate the required consolidation process among Indonesia’s 120+ banks. Another important banking sector reform was the decision to eliminate the blanket guarantee on bank third-party liabilities. BI and the Indonesian Government completed the process of replacing the blanket guarantee with a deposit insurance scheme run by the independent Indonesian Deposit Insurance Agency (also known by its Indonesian acronym, LPS) in March 2007. The removal of the blanket guarantee did not produce significant deposit outflows from or among Indonesian banks. Sharia banking has grown in Indonesia in recent years, but represented only 3.7% of the banking sector, about $14.4 billion in assets as of October 2011. Environment: President Yudhoyono's administration has significantly increased Indonesia's global profile on environmental issues, and U.S.-Indonesia cooperation on the environment has grown substantially. Indonesia is particularly vulnerable to the effects of climate change, which include rising sea levels and erosion of coastal areas, increased frequency and intensity of extreme weather events, species extinction, and the spread of vector-borne diseases. At the same time, Indonesia faces challenges in addressing the causes of climate change. Indonesia has the world's second-largest tropical forest and the fastest deforestation rate, making it the third-largest contributor of greenhouse gas emissions, behind China and the U.S. President Yudhoyono pledged at the 2009 G-20 in Pittsburgh to reduce Indonesia’s greenhouse gas emissions by up to 41% below business as usual by 2020, in addition to eliminating fossil fuel subsidies. Indonesia continues expanding its constructive engagement in Southeast Asia, within the G-20 and Major Economies Forum, and in other international bodies to encourage other developing countries to adopt and implement ambitious steps to reduce the impacts of global climate change. In June 2010, President Barack Obama pledged to support U.S.-Indonesia shared goals on climate change through a Science, Oceans, Land Use, Society and Innovation (SOLUSI) partnership and through the establishment of a climate change center. The United States is providing $6.9 million in support – with matching funds from Norway – for the new Indonesia Climate Change Center (ICCC), which will focus on mapping and monitoring of carbon-rich peat lands and tropical forests with expertise from the U.S. Forest Service, bringing the best available science and analysis to policy leaders on key strategies and decisions to mitigate and adapt to climate change. In June 2011, the U.S. Environmental Protection Agency (EPA) and Indonesia’s Ministry of Environment signed an MOU, expanding environmental cooperation and formalizing cooperation on the “Breathe Easy, Jakarta” initiative to improve air quality and protect public health. Indonesia has the world’s greatest repository of marine biological resources and is one of the most important fisheries. It lies at the epicenter of the Coral Triangle, covering just 3 percent of the globe but containing more than half the world’s reefs and three-quarters of all known coral species. Fisheries generate some 20 percent of Indonesia’s GDP, and over 60 percent of the nation’s protein comes from the sea. The number of coastal fishers in Indonesia has increased by over 40 percent in the last 10 years. U.S. support to Indonesia’s globally important marine resources includes USAID’s five year $35 million Marine Resources Program, partnerships on ocean research and exploration, and maritime law enforcement capacity-building. During the early 1960s under Soekarno, Indonesia pursued a policy of “Konfrontasi” toward newly independent Malaysia, characterized by small-scale but bitter fighting against forces sent to defend Malaysian Borneo. Since the late 1960s Indonesia has had peaceful relations with its neighbors. Without a credible external threat in the region, the military historically viewed its primary mission as assuring internal security. After Soekarno’s fall from power in 1966, Indonesia welcomed and maintained close relations with the donor community, particularly the United States, Western Europe, Australia, and Japan, through the Intergovernmental Group on Indonesia (IGGI) and its successor, the Consultative Group on Indonesia (CGI), which have provided substantial foreign economic assistance.